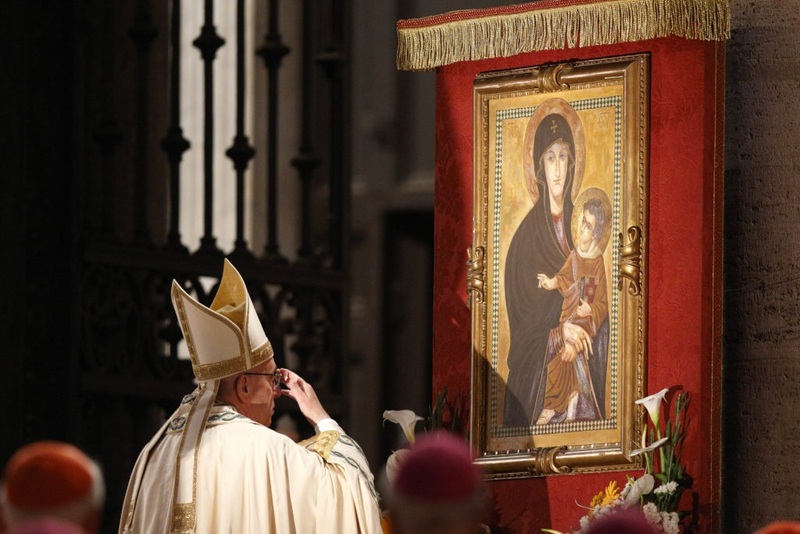 Pope Francis has decreed that Latin-rite Catholics around the world will mark the feast of the “Blessed Virgin Mary, Mother of the Church” on the Monday after Pentecost each year. The Gospel reading for the feast, which technically is called a memorial, is John 19:25-31 – which recounts how from the cross Jesus entrusted Mary to his disciples as their mother and entrusted his disciples to Mary as her children. The decree announcing the addition to the church calendar was released on 3 March by the Congregation for Divine Worship and the Sacraments. Pope Francis approved the decree after “having attentively considered how greatly the promotion of this devotion might encourage the growth of the maternal sense of the church in the pastors, religious and faithful, as well as a growth of genuine Marian piety,” as stated in the decree. Cardinal Robert Sarah, Prefect of the Congregation, noted in a brief commentary published the same day that Blessed Paul VI in 1964 had formally bestowed the title of “Mother of the Church” on Mary, but that recognition of her maternal care for the Church and for believers had already spanned centuries. “The feeling of Christian people through two millennia of history has cultivated the filial bond which inseparably binds the disciples of Christ to his Blessed Mother in various ways,” Cardinal Sarah said. The Church calendars of Poland, Argentina, St Peter’s Basilica and some religious orders already set aside the Monday after Pentecost as the feast of Mary, Mother of the Church. Honouring Mary as mother of the Church on the day after Pentecost also highlights for Catholics that Mary was present with the disciples on Pentecost, praying with them as the Holy Spirit descended. “Mary, from the awaiting of the Spirit at Pentecost, has never ceased to take motherly care of the pilgrim church on earth,” Cardinal Sarah said. He said the Bishops’ conferences would approve the translation of the texts they needed and, after receiving their confirmation, would publish them in the liturgical books for their jurisdiction.